Walking tours available to adult, school and student groups traveling to New York City with Pro Musica Tours. Pro Musica offers a variety of Private Guided Walking Tours throughout all boroughs of New York City to groups traveling with us. If there is a specific type of tour that you are interested in that is not listed here, just let us know - we pride ourselves in customizing your tour to include exactly what you want to see. Your personal tour coordinator is also happy to recommend specific tours based on the interests and composition of your group. Architecture Tours: These tours are customized according to your areas of interest. Learn about how the architecture of buildings such as The Grand Central Station, The Metropolitan Museum of Art, Madison Square Garden and The Chrysler Building have shaped New York, as well as how the city has shaped structures and spaces such as the Brooklyn Bridge, Gramercy Park, and Columbus Circle. Broadway Up Close: Journey back in time to Broadway's early years, full of roof garden theaters, tap shoes, and theatrical con artists. Learn the true difference between a Broadway theater and an Off-Broadway theater and revel in the secrets hidden in plain sight in some of Broadway's most famous theaters. Through our partnership with Broadway Up Close, tourgoers will hear how a show is created from the first rehearsal to opening night and all of the craziness in between. And, of course, we'll explore the spirits that may still be lurking in the shadows backstage with a few unbelievable ghost stories. The Bowery: A walking tour along the most infamous street in New York City history. Join us as we walk the Bowery to discover such sites as Big Tim Sullivan's headquarters, P. T. Barnum`s Circus, McGuirk's Suicide Hall, theaters, dance halls, saloons, criminals, and the Handkerchief Girls. Brooklyn Bridge to Brooklyn Heights: First, we cross the Brooklyn Bridge and recount the dramatic story of how it was built. Then it's on to the Heights, the city's first suburb, to explore the rich architectural, social and literary history. Stops include: Plymouth Church, the A. A. Low Mansion, and sites associated with Hart Crane, Norman Mailer, and Betty Smith. Historic Central Park: A walking tour through New York's collective backyard to explore what is the largest work of art in the city. Designed by Olmsted and Vaux as a place for spiritual uplift, today New Yorkers use it for much more. Stops include: the site of Seneca Village, the rocking chair riot, Strawberry Fields, and the Ramble. Central Park Movie Tour: This walking tour focuses on New York’s largest outdoor movie and television set…. Central Park. Visit The Boathouse Cafe used in When Harry Met Sally, go on location to the Bandshell from Breakfast at Tiffany's and Kramer vs. Kramer, feed the pigeons like Macaulay Culkin in Home Alone II, take a water break at Bethesda Fountain, used in Ransom and One Fine Day, and Stop at Wollman Rink, featured in movies like Love Story and Serendipity. Chelsea Gallery Tour: One of our most popular programs, this 2-hour guided tour of Chelsea’s huge collection of art galleries, you’ll visit 8 modern galleries in the world’s center for contemporary art! Our director previews over 200 exhibits each month and selects the 8 most fascinating and varied ones to explore. You'll see the very newest in painting, sculpture, electronic media and photography, by American and international artists. If you wish, the choice of exhibits can be tailor-made according to the interests and backgrounds of the participants. At each stop, our guide helps explain the artwork and leads the group in lively discussion. The tour is about 6 blocks long and takes place no matter what the weather – rain, snow or shine – as you’ll be indoors 90% of the time. Come experience a world-class treasure of ever-changing art! Chinatown: A walking tour through the largest "Chinatown" in the Western Hemisphere. This tour explores the diverse Asian community of the Lower East Side. Stops include: Quong Yeun Shing (the oldest store in Chinatown), the Kimlau Memorial, and the Museum of the Chinese in the Americas. East Village: Explore the area made famous by radicals and immigrants alike, combining the history of German, Ukrainian, and Jewish immigrants with that of labor activism and the Second Avenue Stage. Stops include: the Fillmore East, Labor Lyceum, and sites associated with Daniel Tompkins, Emma Goldman, Peter Stuyvesant and Sophie Tucker. Ellis Island: Visit America's immigration museum and enjoy an exclusive talk and guided tour of the facility. We'll retrace the steps of the 12 million immigrants who passed this way as they first encountered the "Golden Land." Groups may also select a focus on either Irish, Jewish or Italian Ellis Island if they wish. Financial District: A guided tour of Lower Manhattan exploring the historic and financial heart of New York. This tour traces the development of Wall Street as the world's premier financial center - from its Colonial roots to the Big Board's most recent activities. Stops include: J.P. Morgan's bank, the New York Stock Exchange, Fraunces Tavern, the Federal Reserve Bank, and sites associated with Alexander Hamilton, John D. Rockefeller, and Victoria Woodhull. Gangs of New York: A tour led in conjunction with Miramax Films exploring the history, people, legends and lore of Five Points and Herbert Asbury's 1927 classic The Gangs of New York - recently the inspiration for major motion picture directed by Martin Scorsese. Stops include: the site of Paradise Square, "Murderer's Alley", and sites associated with Bill "the Butcher" Poole, William M. Tweed, and the 1857 Police & 1863 Draft Riots. Garment District Insider Tour: Are you a Fashion-ista? This is the tour for you! Find out about New York City’s apparel industry from it’s historical roots to today’s designers. Learn about The Fashion Walk of Fame, today’s Garment houses, and dependant on designer schedules, get the chance to stop into select showrooms for exclusive shopping opportunities! Gramercy Park and Union Square: Revisit the tumult of Union Square, once home to both fashionable theater and socialist rallies. Then stroll on to the refined streets of the exclusive enclave which surrounds New York's only private park. Stops include: Tammany Hall, the Players Club, and the homes of George Templeton Strong and Theodore Roosevelt. Grand Central Terminal: What better way to learn about the storied past of one of the busiest train terminals in the world than by spending time learning about its splendid nooks and crannies? Visit and learn about the cavernous expanse known as the Main Concourse. Find out why one of the distinguishing characteristics of its enormous astronomical ceiling is the fact that its depiction of the constellations is backward. Discover the secret that lurks within the information booth (the opal "Clock"). Visit the "Kissing Room" and the "Whispering Gallery." Discover what's so special about Coutan's Mercury, Minerva and Hercules, the elegantly restored Campbell Apartment, and more. Greenwich Village: A walking tour of New York's unique and legendary home to artists, writers and radicals, with a special emphasis on the history and architecture of the area. Stops include: the Jefferson Market Courthouse, St. Luke-in-the-Fields Chapel, the Stonewall Inn, and the homes of Aaron Burr, Edith Wharton, John Sloan and e.e. cummings. Ground Zero Evolves: The Freedom Tower has yet to rise, but Ground Zero bustles with activity. Experience the new, temporary World Trade Center PATH Station and ride the rails to Jersey City's Exchange Place Station, passing the stark walls of the "bathtub." We will also explore recent changes to the perimeter, focusing on the refurbished Winter Garden, the new West Street pedestrian bridge, and the exemplary restoration of the Barclay-Vesey Building, one of Manhattan's finest Art Deco landmarks. Historic Harlem: As the center of African American culture, Harlem is one of New York's most intriguing neighborhoods. This tour emphasizes the history, architecture and people of this neighborhood. Stops include: Abyssinian Baptist Church, Striver's Row, and sites associated with Zora Neal Hurston, Marcus Garvey, and Langston Hughes. Historic Lower Manhattan: A wide-ranging tour exploring the history, architecture, and people of Lower Manhattan - the birthplace of New York's long history. Stops include: the Woolworth Building, Bowling Green, Trinity Church, and sites associated with Abbie Hoffman, Cass Gilbert, Captain Kidd, J.P. Morgan, and Pierre Toussaint. Historic TriBeCa: Explore the historical and architectural wonders of New York's western frontier. TriBeCa has come full circle - from residential neighborhood to industrial center and back. Stops include: St. John's Park, the Mercantile Building, and sites associated with architects Carrere & Hastings, McComb, and Bogardus. Immigrant New York: A multi-ethnic walking tour through the Jewish East Side, Chinatown, Little Italy, and what used to be called Little Germany, Little Ireland, and Little Africa. Stops include: the African Burial Ground, Mulberry Bend, and sites associated with Dr. Sun Yat Sen, Mother Cabrini, Jacob Riis, and Abraham Cahan. Irish New York: A walking tour through the former Little Ireland district of Lower Manhattan, between Chatham Square and Houston Street. Stops include Old St. Patrick's Cathedral, the founding site of the Ancient Order of Hibernians, Al Smith's childhood home and the former sites of Tammany Hall and the Five Points slum. 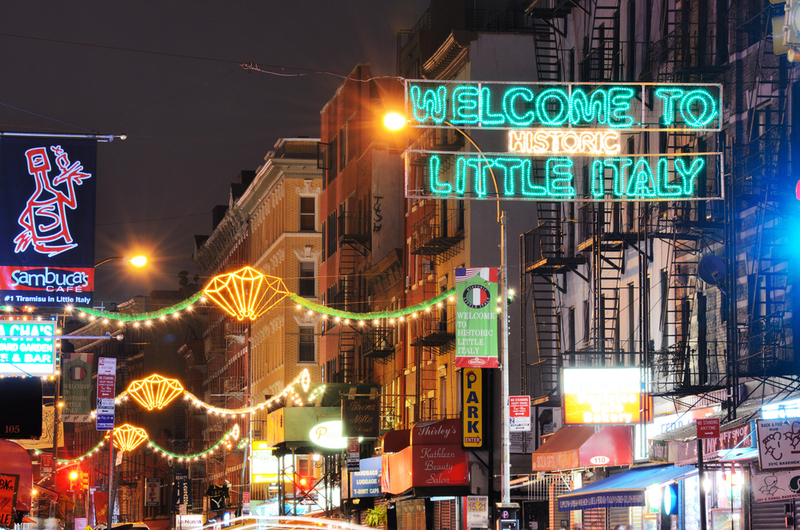 Little Italy: A walking tour exploring the fascinating history of the Italian community of the Lower East Side and Greenwich Village. Stops on this tour include: Mulberry Bend, the parish of Mother Cabrini, and the first church built by Italian immigrants in the district. Immigrant Labor, Immigrant Triumph: A tour featuring the role that immigrants and the labor movement have played in the growth of New York City. Stops include: the Labor Lyceum, the first Labor Day Parade (1882), the founding site of the ILGWU, the Triangle Shirtwaist Factory, and sites associated with Emma Goldman, Louis Kossuth. Jewish Lower East Side: A walking tour through more than 150 years of Jewish settlement on the Lower East Side - once the largest Jewish community in the world. Stops include: the Eldridge Street Synagogue, the Jewish Daily Forward building, and the founding sites of B'nai B'rith. Multi-Ethnic East Harlem: A walk through northern Central Park and El Barrio, exploring these vibrant and diverse communities. Stops include: the Harlem Meer, Duke Ellington Plaza, "La Marqueta," and sites associated with Paul Robeson and Fiorello LaGuardia. Multi-Ethnic Eating Tour: This walking tour is one of our most popular, featuring the historic and gastronomic delights of the Jewish Lower East Side, Chinatown, and Little Italy. Learn about this fascinating "land of the immigrants" while munching on everything from plantains to bialys to dim sum to fresh mozzarella. New York City Ghosts - Haunted Greenwich Village: What better way to explore the tales of New York City's most celebrated ghosts than by joining this historically-oriented tour of reputedly haunted sites in New York City? Stops on this walking tour include a combination of sites associated with: eerie Washington Square Park (including the reputed hanging ground and the park's graveyard); sites associated with Edgar Allan Poe; Mark Twain; Aaron Burr and his daughter, Theodosia; Peter Stuyvesant; Washington Irving; Eleanor & Franklin Roosevelt's little dog "Fala"; the tragic Triangle Shirtwaist Company fire; Fire Patrol Station No. 2 and many others. New York in War & Peace: A walking tour of Lower Manhattan to revisit some of the city's notable battle fields, war monuments, and anti-war protests, as well as places of generals, Confederate spies, peacemakers, and military inventors. Stops include General Richard Montgomery's grave, Fraunces Tavern, the Battle of Golden's Hill, and the Vietnam Memorial. Park Slope: Explore Brooklyn's "Gold Coast": As one of New York's finest residential neighborhoods, Park Slope is a landmark district filled with remarkable architecture and splendid history. Stops include: The Montauk Club, Litchfield Manor, and sites associated with Charles P. H. Gilbert, Mayor William Gaynor, and Adams Chewing Gum. Presidential New York: Homes, monuments, offices, and churches and other sites associated with presidents from Washington to Obama. Revolutionary New York: A tour of Lower Manhattan featuring sites associated with George Washington and our nation's war of independence. Stops include: Fraunces Tavern, the graves of Alexander Hamilton and General Richard Montgomery, Federal Hall, and sites associated with Thomas Jefferson, John Jay, and Albert Gallatin. Shop New York: For those who want the insider shopping tour, this is for you. This guided tour will take you into some of New York’s great shopping areas. Dependent on schedule, select designer warehouse sales are available. SoHo & NoLiTa: Trace the historic evolution of SoHo and NoLiTa, from Italian neighborhood to artist colony, from remote farmland to the Cast Iron District of fashionable galleries and boutiques. Stops include: the little Singer Building, the San Gandolfo Society, and sites associated with Bill "the Butcher" Poole, James Monroe, and Keith Haring. Times Square and The Theater District: Celebrate the diversity of Times Square as we explore the history, architecture, theater and underworld of this legendary area. Stops include: The New York Public Library, Astor Hotel, Palace Theater, Sardi's, and sites associated with the Shubert's, Florenz Ziegfeld, Bob Hope and Evelyn Nesbit. Upper East Side: Come discover the residential, religious, and commercial settings of one of New York's most exquisite areas. The Upper East Side offers not only a panarama of ‘New York Society' but a vital mixture of history, architecture, and culture. Stops include: Temple Emmanu-El, the 7th Regiment Armory, Lever House, as well as the Metropolitan and Union League Clubs. Upper West Side: A walking tour exploring the rich architecture and social history of Manhattan's "west coast". Stops include: Lincoln Center, the Dakota and Ansonia apartment houses, Dante Square, and sites associated with Rudolph Valentino, Rabbi Stephen Wise, and the Parlor Mob. Tour includes a visit to the Luce Center at the New-York Historical Society.